Custom Pedal Boards - It's what we do! We offer the complete pedal board design, manufacture and setup service. We can design and build a custom pedal board for whatever pedal setup you require. Advise you on possible options and configurations to build a better sounding and more flexible solution for your guitar or bass effect needs. From flight cases - power supplies - loop switchers - patch/instrument cables - pedals - essentials. Its all here! Our in-house boutique/custom design and fitting service specialises in setting up your pedals so you dont have to. We use the best cabling, power supplies and loop switchers to give your board the sound and tone it deserves! Home of the original and best Hinged Tier ~ Lift Off Lid ~ Loop Switcher Boards. Made by musicians for musicians! As well as our specialist pedal boards, we also make fully customisable flight cases for combos, amp heads, cabs, racks etc, all built to your requirements. Our ultra rugged touring cases and pedal boards are lovingly designed and hand crafted by our small team of expert craftsmen to the highest standards of quality. Using the highest grade materials we can get our hands on, such as premium grade handles, latches, catches, Latvian birch hex ply, aluminium double angle, various foams, Velcro, even grooved rivets! No expense spared. Unlike similar pedal board manufactures who to often choose the cheaper option, we have a unique eye for detail and design which is evident in our products. 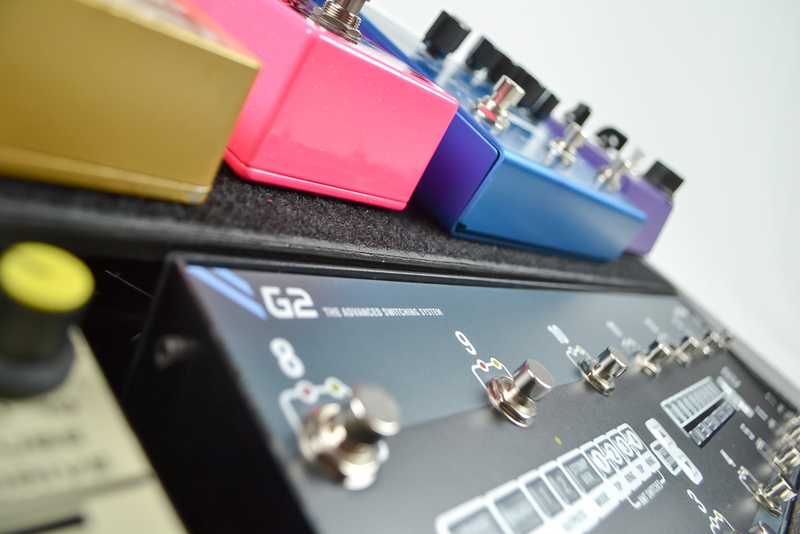 We can quite confidently say our pedal boards are the best of their type in the world! The case is great just got back from the USA tour. Amazing case, the attention to detail, just perfect, it was the most solid flight case of all the gear! UPS just delivered it, it was packaged phenomenally. I just unwrapped it and was thrilled with the look of the case's exterior. Then I opened it and literally laughed out loud with how great a job you guys did. I was considering building my own because I'm a bit OCD when it comes to quality. I'm glad I didn't. This pedal board is PERFECT. Well done! Loop Switching Hinged Tier Pedal Boards are our speciality and we work closely with several loop switching and pedal manufacturers including TheGigRig, Boss and Bright Onion Pedals. We can order any pedal you may require from our suppliers to include on your new custom pedal board. Email info@custompedalboards.co.uk to arrange for your pedals to be picked up by our specialist courier for us to fit, patch, power, set up and test on your new board. Many musicians carry around their expensive gear in cheap and insecure cases, or no cases at all! Often this results in damaged pedals, bad connections or loose wires, broken valves, damaged speakers and grill cloths etc. There's nothing worse than being let down by your equipment at that all important gig. So why not consider proper protection for your gear? I received my pedal board a few days ago. Whoa!!!! The quality and design of the board are second to none...:and I've seen quite a few of them. The pictures and videos of your boards don't do the final product justice. Truly modern works of functional art. Thank you so much for installing the power supply, distributor, and isolators. Also thanks so much for your meticulous attention to detail. The labelling you provided on the boards infrastructure is world class. Chris. Just wanted to say thanks again for such a world class professional grade product. Your knowledge and high touch customer approach relative to how you run your business exceeded my expectations. My purchasing experience was nothing short of amazing. I am thrilled. I recently had a large impressive pedalboard built by Custom Pedal Boards & couldn’t be more pleased! Chris did a first class job; the case is truly bomb proof & the quality of workmanship & general layout & tidiness of wring/ mounting of pedals magnificent. The hinged tier is a brilliant design and offers opportunity to reduce the size of your board to a more manageable size whilst retaining the ability to house lots of pedals and the kit to allow the board to work to it’s optimum. Everyone who’s seen my board has been very very impressed (and jealous!!). The assistance & guidance provided by Chris was greatly appreciated, and his patience in explaining options and all things related to the board/layout couldn't be bettered. Went to my gig last night. Smacked the case into the wall of the club as I went in. Smashed a brick in half! Oh my goodness, it's even more amazing than I envisioned. You were spot on about what specs I needed and I couldn't be happier!!!! Also impressed by how fast you got it to me and how well it was protected during it's long journey. Everyone I meet will know how much I love it because I won't stop telling them! Thanks SO much for your excellent quality and great customer service! If you're a serious musician, a Custom Pedal Board is a must for your pedals. Tired of the rest of the band waiting for you to set up your equipment? With our gigging & touring solutions it's quick and simple. Now you will be drinking a cold one at the bar while waiting for them to finish setting up! All of our products are designed and hand made to full flight specifications, by our in-house highly skilled, experienced craftsmen and performing musicians to stand the abuse of life on the road. We firmly believe that integrating performing and touring experience in pedal board and flightcase design is what makes our products both unique and better suited to the working musician. Custom Pedal Boards is based in North Wales. Whatever your flight case or pedal board requirements please get in touch and find out what we can do for you! We now ship WORLDWIDE, get in touch for a shipping quote!